Ag@CuO core shell nanostructures (ACCS NSs) was successfully synthesized using Ocimum tenuiflorum leaf extract when applied for non-enzymatic glucose sensor. SEM, HR-TEM, XRD, UV–vis, and FTIR were used to estimate the structural, optical and morphological properties of ACCS NSs. 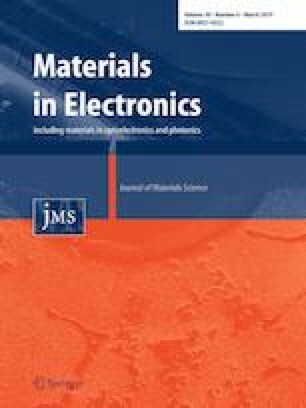 Cyclic voltammetry and ampherometry were used to determine the electrochemical and electrocatalytic characteristics of 0.2 wt% ACCS NSs with screen-printed electrodes (SPEs) to sense glucose in 0.1 M NaOH solution. Optimum potential was obtained at + 0.4 V of current response with a linear range of 1 to 9.2 mM. In addition, 0.2 wt% ACCS NSs with SPEs had a low detection limit of 0.006 μM and sensitivity of 3763.44 μA mM−1 cm−2. Modified ACCS/SPE electrodes were highly selective for glucose in the presence of chlorine ions, sugars and non-sugar compounds. It could be inferred from the evidence that the ACCS NSs performs effectively in the aspect of non-enzymatic glucose sensing. The online version of this article ( https://doi.org/10.1007/s10854-019-01307-y) contains supplementary material, which is available to authorized users. Dayakar Thatikayala acknowledge the fund support of Rajiv Gandhi National Fellowship (RGNF) (F1-17.1/2013-14/RGNF-2013-14-SC-AND-41054), University grant commission (UGC), Government of India and acknowledge the center for nanoscience and technology, IST, JNTUH, Hyderabad, Telangana, India for providing lab and instrument facility.